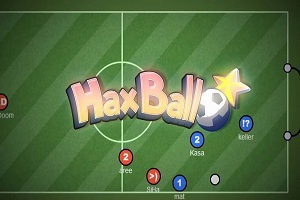 Cool Math Haxball is a multiplayer 2D pong or soccer game. You should join a team and play for them to get the higher score which is the essential element to determine who the winner is. To start to play Math Haxball, you need to choose a nickname, the nearest room or create the own match. After that, you can show up your ability to beat the opponent. The other can do the same for you. Don’t let them achieve their target! Good luck! Use arrow keys to move, X to kick.